Фотобанк Rusmediabank – лицензионные Фото, Видео, Музыка - Thessaloniki, Greece - September 22, 2018: acoustic guitar in action on stage performing at a rock concert at the open theater of the city, blur stage spotlight with laser rays. 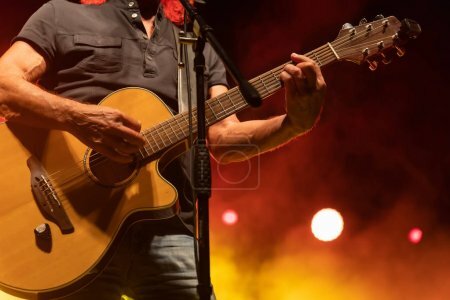 Thessaloniki, Greece - September 22, 2018: acoustic guitar in action on stage performing at a rock concert at the open theater of the city, blur stage spotlight with laser rays. XL 6720 x 4480px 15 Mb.